Breaking away from his modus operandi, UFC president Dana White on Saturday night revealed the next fight for not one, but two fighters that had just stepped out of the Octagon at UFC 123: Rampage vs. Machida. After the post-fight press conference, he revealed that B.J. Penn, who had just dispatched Matt Hughes in 21 seconds, would next face Jon Fitch at UFC 127 in Australia. During the press conference, White gave in to George Sotiropoulos’ demand from earlier in the week, revealing that the Aussie would next fight on his home turf in Sydney against Dennis Siver. Sotiropoulos submitted Joe Lauzon earlier in the night, surviving a strong first round by the former “Ultimate Fighter” competitor. It was his seventh consecutive win in the Octagon, and eighth straight of his current overall winning streak. 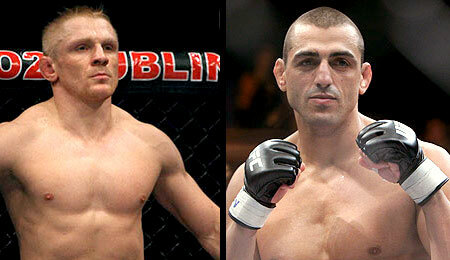 Siver is on a two-fight winning streak, submitting Andre Winner at UFC 122 in Oberhausen, Germany, one week ago. In addition to Penn vs. Fitch, Sotiropoulos and Siver join a welterweight showdown between Carlos Condit and Chris Lytle on the UFC 127 fight card.